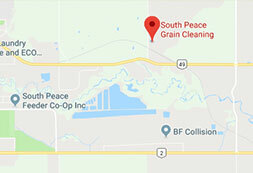 In 1963 grain producers from Rolla, Dawson Creek, Progress, Groundbirch, Baytree, and Bonanza formed the South Peace Grain Cleaning Cooperative Association to construct a seed cleaning facility for member producers. Without the cooperation, communication and support of the entire grain producing community the facility would have remained a pipedream. Bolstered by support from the City of Dawson Creek, local businesses, the B.C. and Alberta governments and the hard work of the founding members the original facility was built and operated successfully until 1987. At that time the Cooperative built a new seed cleaning facility to accommodate increased demand for cleaning services. Since then South Peace Grain has continually updated, modernized and improved its lineup of seed cleaning equipment. As a Cooperative, our primary focus has always been providing excellent service and high product standards to our members. The addition of products for retail, such as feed, pedigreed and common seed, forage seed and livestock handling systems, is in an effort to keep up with the evolution of agriculture and offer value added products and services to our members and customers. South Peace Grain is run by a General Manager, Shaun Grant, and a team of staff. As a cooperative association a Board of Directors is in place, made up of seven grain producers who are also members.